Former Marine Sgt. 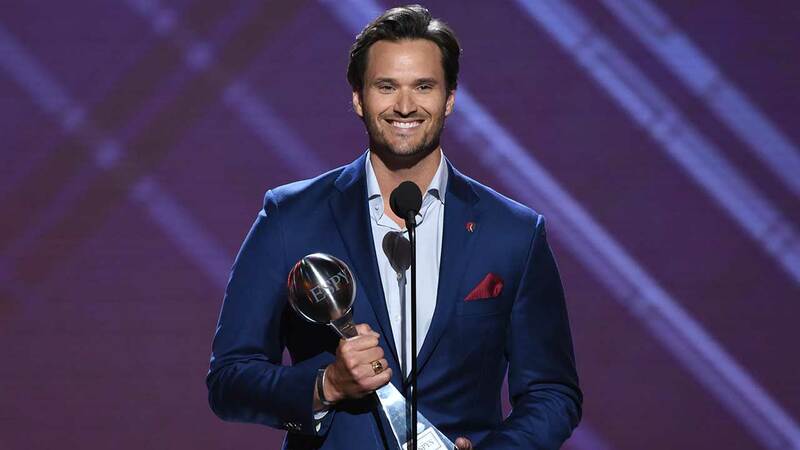 Jake Wood was honored at the 2018 ESPY Awards with the Pat Tillman Award for Service. As a freshman offensive lineman with the Wisconsin Badgers, Wood was inspired by the first responders of the September 11 terror attacks who risked their lives to save others from the Twin Towers. Wood joined the U.S. Marine Corps, where he was eventually promoted to sergeant and served four years in Iraq and Afghanistan. He earned a Navy-Marine Commendation Medal during his time of service and was honorably discharged from the Marines in 2009. Wood saw the difficulties veterans faced after leaving active duty when he returned to civilian life. On January 10, 2010, Wood found a way to help veterans and also those in need after the devastating 7.8 magnitude earthquake in Haiti. Wood and fellow Marine William McNulty brought together a group of veterans, medical workers and first responders and headed to the island, beginning his nonprofit organization Team Rubicon. Since then, Team Rubicon has responded to over 250 disasters around the world and has grown to 80,000 volunteers. "In Pat Tillman I found a man of courage and conviction, and his sacrifice inspired me to serve," said Wood told ESPN. "As I think of this award, I can't help but think that if Pat were still alive that he'd be wearing Team Rubicon's iconic Grey shirt and serving alongside us."